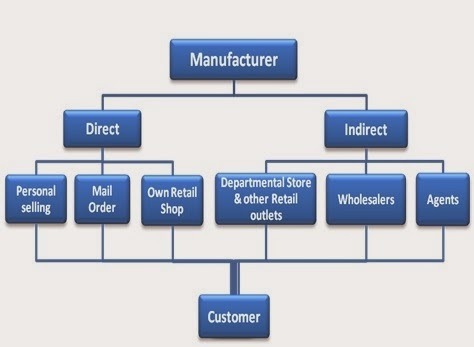 Channels of distribution can be grouped under two major headings: (i) Direct Selling by manufacturer and (ii) Indirect Selling through middlemen. For direct selling, the first option involves supplying the product to the customer using your own salesmen and arranging your own deliveries. The second option is using the medium of post office. You obtain orders from your customers who respond by mail or telephone to your advertisements or to letters mailed directly to their houses. You deliver your products to them through mail or through some other carrier. The next alternative is to establish your own retail stores. Bata Ltd., for example, has established its own retail stores throughout the country. This practice has also been adopted on a smaller scale by a number of textile mills who have their own retail shops like Calico Mills, Raymonds, DCM etc., has franchised a number of retailers to sell their products to the consumers. But in most cases, manufacturers have to take the help of a variety of agencies or middlemen to reach their ultimate customers. These agencies are called by various names which generally follow the services they perform. They are generally classified as (i) functional middlemen or (ii) merchant middlemen. The functional middlemen are those intermediaries who perform various marketing functions without having title to goods. More important of ' them are mercantile agents like brokers and commission agents. On the other hand, merchant middlemen obtain title to the goods with a view to selling them at a profit. They take the risk involved in marketing and work not for a certain percentage of commission but for a margin of profit. More important of them are wholesalers and retailers. Let us briefly describe each of these options. An example of direct selling is provided by Eureka Forbes Ltd. (EFL) a Bombay based company, which markets vacuum cleaners and water purifying equipment. It believes that if the market is in the customer's house, the best way to get there is to knock at the door. The company has clearly demonstrated that door-to-door selling can be effective in Indian conditions. Its salesforce of over 500 people spread out over nearly 40 branch offices in 29 towns make it the country's largest commercial direct sales organisation. Between 1982-83 and 1985-86, their sales of vacuum cleaners, water purifiers etc. have gone up from Rs. 3.3 crores to Rs. 11 crores. They took the cue from Electrolux, the world's leading manufacturer of vacuum cleaners, and a firm believer in door-to-door selling. During the last few months EFL has tried to reach the customers through distributors also. The main point in favour of direct selling is the need to: (i) enlighten about additional features and (ii) educate the user about how to use it. They take neither possession nor acquire ownership of the goods but only serve to bring the buyers and sellers together. They negotiate purchase and sale of goods on behalf of other parties. Their task is over as soon as the buyer and the seller come to terms in respect of the purchase or sale of the goods. The broker works for a certain percentage of commission on the business transacted by him on behalf of his principal. They also sell goods on behalf of the sellers. But they differ from brokers in that they not only negotiate the sale of goods but also take possession of the goods and make arrangements for the transfer of title to the goods. The commission agent has to perform the functions of warehousing, grading, packing or sampling in addition to assembling and dispersion. For their services, the commission agents get a certain percentage of commission on sales. If the commission agent is authorised to sell on credit and agrees to bear the risk of bad debts for some additional commission, he is known as a del credere agent. Wholesalers are those merchants who act as intermediaries between the primary producers, manufacturers or importers, on one side, and retailers or industrial consumers on the other. They buy goods and commodities in large quantities with a view to selling them to retailers in smaller quantities. They assemble merchandise from many sources, warehouse and regroup the goods for convenient buying by retailers. Thus wholesalers make it possible for the manufacturer to sell to a large number of retailers to whom the merchandise cannot be easily sold directly from the factory. · Assembling-The wholesaler collects varieties of product from different manufacturers and keeps them in stock for sale to the retailers at the time when they need them. · Dispersion-The products assembled and stocked by the wholesalers are supplied to the retailers who may be widely scattered. · Warehousing-The goods purchased by the wholesalers from the manufacturers and producers have to be stocked in warehouses pending their sale to the retailers. The arrangement for such storage is the responsibility of the wholesalers. · Transportation-The wholesaler has to move the goods from the various factories to his own warehouse and from there to the retail stores. He may do so either by employing his own vans or by hiring public carriers. · Financing-The wholesaler in most cases provides goods on credit to the retailers. · Risk-assuming-The wholesaler assumes the risk arising out of the changes in prices and demand as also loss due to spoilage or destruction of goods in his warehouse. · Grading and Packaging-The wholesaler has to sort out different grades of products according to quality and other considerations and pack the goods into smaller lots for retailers. A resume of the above functions makes it clear that the wholesaler renders valuable services to both the manufacturers and the retailers. · The manufacturers get the benefit of bulk orders from wholesalers. He does not have to take the trouble or incur the expenses of procuring large number of small orders. · Wholesalers remain in close touch with the retailers and keep themselves informed about the changes in the direction and pattern of demand and thus help the manufacturers in planning their production. · The wholesaler places bulk orders with the manufacturer and thus enables him to concentrate on production. · The wholesaler relieves the manufacturer of the botheration of performing most marketing functions. · The retailer need not stock goods in unduly large proportions and can replenish his supplies from the wholesalers as and when necessary. · The wholesalers provide goods to the retailers on credit and the retailers need not block their funds in idle inventories. · The wholesalers generally specialise in a few lines of goods and try to obtain their supplies from the best and the cheapest source. The advantages of such specialisation are passed on to the retailers in the form of lower prices. · The wholesaler assumes most of the risks involved in marketing functions such as price fluctuations and spoilage or pilferage of goods. · Wholesalers keep the retailer informed of the new types of products that are being introduced in the market. This gives the retailers an opportunity to extend their business. A retailer is defined as "a middleman who sells mainly to the ultimate consumer. He may sell to institutions but most of his sales are made to industrial or household consumers. He usually sells in small lots". The retailer is the last link and the most important intermediary in the chain of distribution. Mass production in the present day set-up is geared to the requirements of the ultimate consumer. Retailers are directly and intimately in touch with the ultimate consumers and thus occupy a strategic position in the whole chain of distribution. The basic feature of retail trading is the purchase of goods from wholesalers and selling it in small lots to consumers. Thus retailing includes all activities directly related to the sale of goods to the ultimate consumers. The retail shop is one of the oldest and most widely used business establishment in any country. Retail business originated through the use of peddlers engaged in house to house sales. This was followed by opening up of small retail shops usually owned by sole proprietors or small partnership firms, which are frequented by customers for obtaining their requirements. In course of time, large retail stores like department stores became popular in developed countries and some developing countries as well. In addition, people living in far off places are served by mail order houses who solicit business by catalogues, advertisement in popular magazines or correspondence. The latest development is retailing through automatic vending machines. Most standard items in standard packs including food items are available in most developed countries through automatic vending machines located at convenient places like railway stations. Milk-vending machines are now being used by Mother Diary in India. · Estimation of the probable demand of the consumers for the various types of goods dealt by him. · Providing information about consumer tastes and preferences to wholesalers/ manufacturers. · By holding ready stocks of various commodities required by the consumers, retailers relieve the customers of the need for stocking a wide variety of goods which could be extremely inconvenient and cumbersome. · By keeping a good assortment of the various varieties of a particular product, say soaps, toothpastes, etc. retailers provide a wide variety of choice to their customers. · By proper display of new products, the retailers keep the consumers informed about the changing trends in production of different varieties of goods, besides helping manufacturers to promote their products. · Retailers very often guide their customers about the relative merits of the various brands of a particular product and thus help them in the selection of goods. · Retailers may provide special facilities to their customers, for example, free home delivery, extension of credit, after-sales service, etc. · Economical Buying-wholesalers know what, when and how much the retailers will buy. · Economical warehousing and delivery-as the wholesaler knows the nature, amount and frequency of retailer's orders, he can plan his operation in the most economical manner. · Economy in selling because the effort involved in selling is substantially reduced. · Economy in office and administrative expenses-the work involved can be better planned and organised. · Reduced wholesale expenses permit the wholesalers to quote lower prices to retailers and this in turn permits a reduction in retail prices which ultimately benefit the consumers. There is a wide variety of retail trading establishments. They vary from hawkers and peddlers to big departmental stores. Hawkers and peddlers move from door-to-door in residential localities to sell their goods. Pavement shops usually arrange their wares at busy street corners or pavements of busy streets. Some traders sell their wares at weekly markets which are very common in rural India, and are not uncommon in urban centres. For example, in Delhi there are weekly markets in all principal localities. Then there are fixed shop retailers who operate from shops in busy markets or even in residential areas. These stores may be either general stores dealing in a wide variety of goods needed by consumers in their everyday life or may be shops dealing in a particular item, as for example, cloth, shoes, building materials, electrical goods, confectionary, etc. Stores dealing in a particular line may further specialise, as for example, children's wear in clothing. Then there may be bigger stores like departmental stores and multiple shops. As all of us are familiar with small scale retail establishments and their modus operandi, we will confine our discussion to a limited variety of large-scale establishments. Department stores grew up in developed countries mainly to cater to the requirements of well-to-do people who required articles of high quality and looked forward for comfortable shopping. But they have also become popular in urban centres in many developing countries. In India too, we find a number of department stores coming up in urban centres, specially in Metropolitan Cities. Spencers and Nilgiri of Madras, Kamalalya of Calcutta and Akbarally of Bombay may be cited as examples. 1. Department stores make shopping convenient to consumers by providing them a whole range of goods in one building. 2. Their central location attracts a large number of customers leading to a large turnover. Thus they can afford to make large profits even with smaller margins. 3. Bulk-buying by department stores enables them to obtain heavy discounts from manufacturers and thus buy at a cheaper rate. There are savings in freight charges as well. 4. Department stores can afford to have effective advertising through press, radio and television and thus they are able to attract more and more customers. 5. Being large business units, department stores can afford to employ skilled and expert staff for all their operations and thus they are able to achieve a high degree of efficiency in their working. 1. Experience has shown that operating costs of department stores tend to become very high because of the necessity to run some departments at a loss to attract customers and heavy emphasis in service. As a result, more often than not, their goods are marked at higher prices. 2. Central location also involves higher rents and thus higher overheads. Central location may not be convenient to persons living in far off places which means that they will make their purchases of articles of everyday use from nearby shops. However, in recent years, department stores have branched themselves out to suburban areas as well to reach the customers nearer their location. 3. It may not be possible for customers in general to receive personal attention which is possible when they deal with small retailers. 1. Consumers can be sure of the quality of goods in the sense that there is no possibility of a adulteration practised by some retailers in the private sector. 2. These stores are able to offer various products at more reasonable prices than most other retailers. 3. Consumers are assured of availability of certain products even when there is an overall shortage in the market and that too at reasonable prices. Retailers usually take advantage of such situations by either increasing prices or earmarking supplies to their favoured customers. 1. Consumers do not patronise these stores regularly, coming to these stores only in times of shortages. 2. In practice, they have not been able to reap the benefit of bulk purchases from manufacturers. 3. Large cooperative stores tend to suffer from all the drawbacks of bureaucratic management. In Delhi, the two large cooperative stores mentioned above have usually thrived on the basis of purchases made by Government departments, Government controlled autonomous institutions and public sector undertakings. 1. Each shop deals in the same type of goods and products. 2. The goods dealt are generally those meant for everyday use. 3. There is a high degree of standardisation and uniformity in the interior layout of stores, window displays and outward appearance. 4. A uniform policy of sales is adopted. 1. Multiple shops are able to offer lower prices due to the economics of bulk buying. 2. As sales are on cash basis, losses on bad debts are eliminated and accounting is also made simpler. 3. Rapid turnover and common advertising for all shops make the operation of multiple shops economical. 4. Any shortage of goods faced by one branch can be easily made up by transfer from some other branch in the same city. 5. Since advertising material and interior layout of each shop is Similar, each shop serves to advertise the other shops. This leads to further economy in advertising and a quicker turnover. 1. Multiple shops cannot offer the variety of choice which department stores or even ordinary retail stores offer. 2. These shops do not normally offer home delivery service or credit sales and thus lose a good number of customers. 3. Each unit is controlled by the head office and thus branch managers cannot adjust their sales poly to local conditions and emerging opportunities. 4. Limitations of bureaucratic organisation usually creep in so that the shop personnel tend to lose initiative.